Exploring the avocado benefits you will find that not only is it healthy it has a HUGE number of uses. Both topical and edible. The Avocado is actually classified as a “berry”! Hard to believe I know but there you have it. The high fat food we love for all its health and versatility is actually a fruit of the berry type. It is also a good source of protein which is necessary to maintain muscle and weight loss after 40. A person can take advantage of the high fat content by using them in food dishes that call for added fat – like butter – and substitute with this high fibre fruit. The many diverse benefits of the avocado for health include the reduced risk of heat disease. Because of the unsaturated fat in the avocado being a “healthy fat” using this in place of the usual saturated fats in the diet has been shown to improve heart health. Another benefit of the healthy avocado fats is it can help to keep a persons blood sugar levels in a healthier range because of its ability to reduce the rate of digestion. Foods metabolized slower will give a person a full feel longer which also contributes to reducing overeating and frequent eating patterns that can lead to obesity and other problems. Avocado as a moisturizer for hair and skin has been used for centuries. The protein from the fruit works wonders on the hair. Gently mix together until smooth. Use a spoon to press against the sides to upshot any lumps while mixing. You now have a wonderful (both tasty and hair healthy) avocado hair mask. Gently add the mix to your hair and evenly apply. Put on the shower cap and allow to soak for 60 minutes. After the 60 minutes give your hair a good rinse. Many report that using the avocado hair mask will help to strengthen the hair and add to its shine and bounce. 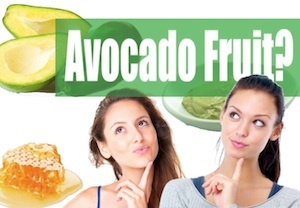 Already you have discovered two of the important assets of the avocado that contributes to a persons weight loss. One is the healthy fat. A great substitute to unhealthy fats and has many diverse uses. The other is its quality of slower digestion so a person can feel full longer. This is in part the fat content and the other is the high fibre content. The benefit is so good – if you add just on half an avocado to a meal the urge to snack later is reduced. The avocado is incredibly versatile and can be added to a meal plan in several ways. When using it instead of butter just add the same amount to replace it. The high fat will take over the intended job and the taste also includes a multitude of vitamins and nutrients. Make dips, add to soups, toss with a salad, or just eat them raw. Find out more about the differences in good fat and bad fats.